Can you give me a little background about yourself? ANGUS: I was born and raised in the province of Nova Scotia, Canada. I grew up in a farming community, 20 miles out of a town called Amherst. The community was called Linden. I got my high school degree from Pugwash District High. I would perform in variety concerts doing impressions of different TV celebrities of that time. Later on, I started using puppets instead of doing stand-up impressions, and I felt more comfortable doing that. It was when I was in grade 12 that I saw the newspaper clipping which said that Jim was going to be making Fraggle Rock in Toronto. I took the clipping to my school Guidance Counselor and asked him if it was a stupid idea to try and go for this. His answer was, "No it's not a stupid idea. All they can say is no." The problem was where, when, and how? With help from a few friends and teachers, I found myself on a plane bound for Toronto. What fostered your interest in puppets? Was it an interest in puppet building or puppetry? And the building grew out of that? ANGUS: Yeah, the building grew out of that because there was nobody here to build the puppets. Literally, I'm still in that situation. There's nobody around here that builds puppets the way the Muppets build them. So it's building by necessity. ANGUS: Yes, and it still is. Building is not an area that I like too much. Though I like the end product. I prefer the performing, but you cant perform without a puppet. Where were the actual auditions for Fraggle Rock? Were they in Toronto? So that was quite a long drive for you from Nova Scotia. ANGUS: It was a two-hour plane ride. We went to Toronto for the auditions and had one hell of a taxi ride on the way there. I was wondering if we were going to make it there or not. ANGUS: Alive. Timing was no problem. This guy was driving like a bat out of hell. 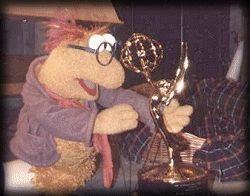 Look what we have here... Morris Fraggle, one of Terry Angus' characters, inspects one of the many awards won by Fraggle Rock. What kind of trepidation was there on your part concerning the auditions? I know your mother accompanied you. Crazy! I don't believe this!" So my mother turns to me and says, "Look, if they want crazy, you give 'em crazy." So I said, "Okay." Now I know that this guy I'm going to see is a completely crazy person, so I guess I've got to go in with the same attitude and just work with it and be aware that it's there and try not to let it faze me. So I go in there and Richard Hunt barks off all of these commands. "HEY, MY NAME'S RICHARD HUNT. HOW ARE YOU DOING? HEY, SIT DOWN THERE. OH YOU'RE FROM NOVA SCOTIA. OH THAT'S GREAT!" He was drilling them right off. And "OH, WE GOT TO GET A PICTURE OF YOU. JUST STAND OVER HERE AND LOOK INTO THE CAMERA AND SAY SMILE. WELL MAYBE NOT SMILE ANYWAY HERE'S THE PICTURE." He just keeps going on like that and sits me down, then goes, "OKAY SO LET'S SEE WHAT YOU CAN DO." There's silence for a few seconds there. "Okay." So I turn to my suitcase, open it up, and keep my back to Richard so he couldn't see what puppets I brought out. They had puppets there anyway, but I brought puppets as well. So I brought out these different homemade versions of different puppets. I had a crude little Floyd, and a Kermit, and a crude Fozzie as well, and I impersonated the voices and did them there for him plus a couple of my own creations. I brought out Kermit for Richard somewhere in there and he got a kick out of that and was playing off of it. He was very mean to the frog. I said in my best Kermit, "Ah, excuse me, Mr. Hunt, I *really* don't think you should be treating people like this." "OH YEAH? WHAT ARE YOU GONNA DO, FROG?" "Uh, err, *ahem* nothing." He liked it and asked if I could stay the rest of the week. My mother had to go back home, but I stayed on at my relatives' in Markham and came back on Friday night to see Jim. That audition was a little more laid back. Jim was a very quiet person, as you know. I went in there and all of a sudden I had one of those moments where everything was in slow motion. That's what it felt like. He came over to me and said, "My name's Jim Henson and welcome. Sit down." Then I brought out the same menagerie of puppets, and did Kermit at the very end. This time I said, "Hi daddy." He laughed at that and came back saying, "What the hey!" in his Kermit voice. Then he brought out this book and started signing it and I thought, well, I'm being told very nicely with a little present "Thank you for coming, we don't need you sort of thing. Or I got the job. I don't know what made me ask it right out, but I asked him, "Well, does that mean I get the job?" and he said, "Oh yeah, sure." After that they actually had me sit there and do impersonations of any Muppets that I could. Just for fun or part of the audition? ANGUS: Both. They were amazed that I could do Kermit so well, and surprised with the Fozzie I did, and the Floyd Pepper. So they started shooting out names of characters and I'd try to impersonate them. Most of them I could do and a couple I couldn't. After it was decided that you were going to be a member of the cast, what was the procedure then? I'm assuming production didn't start immediately. Did you return home? 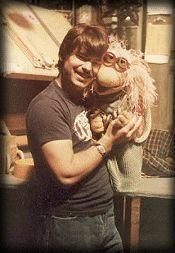 Terry Angus with one of his most memorable characters, Storyteller Fraggle. ANGUS: No, the production didn't start immediately. I believe it started 1 or 2 months later, but I'm not entirely sure when it started, it's been so long. They wanted some people to stay behind to learn how to perform the puppets better. Some of them were just actors, jugglers, and mime artists and a few of them had never had a puppet on their arms in their lives. I had taught myself how to use television monitors back in high school. The school had this old black and white reel-to-reel machine. It was a really ancient thing, with a camera and I taught myself. So during that span you had to relocate to Toronto. ANGUS: At first, for the pilot, a friend I knew back home had set me up at the YMCA, and I asked myself this question a lot of times, "Why the YMCA?" Actually, the YMCA was pretty bad. It was the most run-down place I have experienced in all my life. Well, they have that reputation. ANGUS: Although they did watch The Muppet Show at 5:00 PM in the TV room. I didn't make it through the whole week. Suffice it to say I got a better place. Thank god the Muppet people actually helped me out a bit after that, Martin Baker mainly. Martin helped me out the following year to find a better place. What was the orientation like for the people that were hired? Was there a meeting to explain the concept of the show? ANGUS: That was laid out back in the auditions. They were giving out these 6 or 7 pages of what the show was about with Michael Frith drawings of what the characters would look like. There were also photos of the early prototypes for Gobo, Red, Mokey, Wembley, and Boober. At that time it was a mystery as to who Doc was, so in the drawings, we only see the back of Doc, with Sprocket next to him. We got our basic information out of those handouts. We knew what Fraggles were at that point. They were creatures that had a lot of fun, liked to party, and wear silly hats. That's how they were described early on in the handouts. Well, we know when you first met Richard and Jim. When did you meet the other Muppeteers? ANGUS: We met them during the rehearsals. At that time, during the pilot, we knew of each other but we didn't get to know each other that well because, unfortunately, there was a budget axe that was about to fall. We knew that two of the background puppeteers were going to be let go. At that time, there were twelve of us that were chosen. That's why there are more Fraggles in the pilot than in the rest of the series. So, knowing that two of us were going to be let go it was hard to form friendships with that knowledge. What was your first impression of the Muppeteers? ANGUS: I guess I had a little bit of a star-struck impression of them. They were very friendly, open people, especially Karen (Prell). They all welcomed you with open arms. Dance your cares away" (and so on). At that time everything was zipping by so fast they didn't show how everything was connected. Finally, the final theme had us go through the window of Doc's workshop. Then down the tunnel and we see how everything connects to the Fraggles. We then brought up the Doozers, they're in there with the Fraggles, then Gobo goes down another tunnel and finds himself out by the Gorgs' garden. When was Gerry Parkes (Doc) brought in? ANGUS: Gerry was probably brought in after the puppeteers were finalized. They probably held Gerry's auditions at the same time they had ours. I'm sure of it, because it makes sense to kill two birds with one stone while you're there. When did things begin to loosen up amongst the performers? ANGUS: I think halfway through the first season everyone started feeling comfortable with everybody. We got to know each other well and pairing off in our own little family groups. My group included Karen, Myra Fried, and Tim McElcheran, who wasn't a puppeteer but a special effects guy. Great guy too. You'd get little cliques like that. Well they hung out together like crazy anyway. They also loved to scare each other. For example, Dave would wait under a set of stairs just as Steve got to the bottom. Dave would jump out and scare the Blobis off Steve. Blobis was a Fraggle's tail. And Richard wasn't on set all the time, right? ANGUS: No, because his characters were very limited in the show. He was more so in the beginning, because he had to help everybody get the hang of performing. He was everybody's teacher. He kept us Canadians in line, so he would hold some meetings in a room with us and tell us what's what and lay down the basics of how we were to operate, and also to keep us practicing during that first season. After the first season, Richard didn't come in as much, because his characters weren't really called for that often and all of us Canadians were getting a chance to do characters every now and then which gave Richard a chance to have an easier time of it. Plus, he was going down to New York working on Sesame Street. Meanwhile, Jim was rarely there too, he'd be off working on Labyrinth or some other project. Was the mood different on the set when it was known Jim was going to be there? ANGUS: No, it didn't change at all. We were all still just a bunch of clowns, basically, and Jim was the biggest clown of all. He kept the atmosphere so light that nobody knew the boss was there anyway. Very rarely were we conscious of, "Okay, the boss is here. Maybe we ought to be a bit better." He was just one of us. 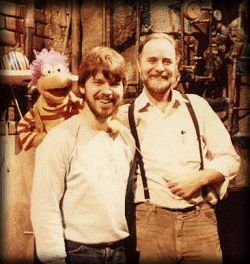 Do you have any special memories of the main Muppeteers? Terry Angus, Jerry "Teddy Bear" Nelson, and Gobo on the set of Fraggle Rock. ANGUS: Dave Goelz used to tease me a lot. I did the first few Traveling Matt shots with him. He would have me control Matt's other arm, and he would turn to me and go, "Okay now, Terry, don't screw up here." (Laughingly), "What, on an arm?" Dave was also joking once about having Traveling Matt go over Niagara Falls in a barrel with me in the barrel working Matt. Steve was a bit of a mystery to me. I never got to know him that well. He was a quiet guy but very nice. Kathy Mullen was a pro. Her puppeteering was choreography to a hilt. She was into choreography. She would come up with these elaborate ways of having the puppets move. Which was great and it showed, unless you were lazy and wanted to just do the 'back and forth' thing. Kathy was another very nice person too. Karen was very down-to-earth and friendly with everybody. Karen was everybody's pal. She'd pretty well give you the shirt off her back. I don't think there's one person I know of who could say a bad thing about Karen. She was like a big sister to me and helped me out quite a bit during the first and second season. I was at first somewhat quiet, and I would find it hard to relate and she brought me out a bit and got me to socialize a bit more. Karen's a great lady. That's all there is to it. And then there's Jerry Nelson. The "Teddy Bear" is what my wife calls him. He looks big and gruff, but he's so loveable you could hug him. A nice piece of advice that Jerry gave me, which I never really used that well, was when I was trying to create "Blizzard Island." In the midst of trying to negotiate, I had lost a lot of the rights and Jerry told me, "Don't let them get everything, pal. Be strong, go in there and fight, and don't let them get you." I may have lost the rights to the show, but I was able to retain the rights to the Blizzard Island puppets. Dave Goelz helped me out a lot to on "Blizzard Island." He taught me how comedy works. One of the things I learned from him is that there is a "1... 2... 3..." delivery gag. Say you have a scene of maybe 3 characters. The first guy is thinking to himself, "Gee, I hope this thing doesn't kill me." The second guy says, "Oh my gosh, it's gonna get us." And the third guy has a punch line, "Gee, did I leave the stove on this morning?" So, there are two straight lines, then the gag line at the end. That was a bad example, I'll admit. For Jerry Juhl was the voice of Taminella. Terry impersonated the voice for Sidney the Witch. Impersonation is the greatest form of flattery."